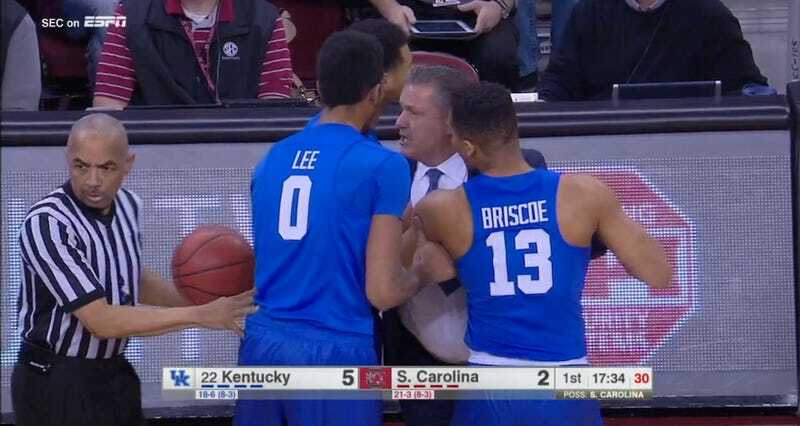 The #22 Kentucky Wildcats are on the road down in South Carolina this morning, and it took John Calipari mere minutes to get all riled up at officials and get himself tossed. Weirdly, it was after a foul was called against the Gamecocks. Two years ago, Calipari also got ejected from Kentucky’s game in Columbia. His at-the-time #17 Wildcats lost that day. He must just not like the state? Anyway, South Carolina is a very good team, and they’re somehow unranked even though they’re 21-3.